The obese woman weighs just over 17 ½ stone [111 kgs], the one on the right just under 8 ½ stone [54 kgs]. Their muscles (shown in red), bones (white), organs (black) and fat (yellow) are all clearly defined. Spot the difference: The obese woman on the left has fat around her organs (shown by the yellow areas) and an enlarged heart which can have dire consequences on her health. The more difficult breathing becomes, the harder it is to get enough oxygen circulating in the bloodstream. This can lead to lack of energy, impaired immune system and even high blood pressure, as the body tries to compensate. This is because lungs are not solid structures and can be compressed. 'Being obese means the hip joints have to carry a lot of extra weight, so they wear out sooner, causing arthritis where there is susceptibility,' says Mr Hayton. Obese patients who need hip replacements will find the operation more physically stressful. Moreover, surgeons may be less happy to operate. One American study found obese people have a significantly higher risk of post-operative complications, such as heart attack, wound infection and urinary tract infections. The same study found that morbidly obese patients (those more than 100lb over their ideal weight) were nearly twice as likely to die as a result. The larger woman shown here is apple-shaped, meaning she's carrying fat around the organs. However even if you're the supposedly 'healthier' pear-shaped, excess weight still puts you at high risk of osteoarthritis and varicose veins, warns Mr Hayton. 'Excess fat is more worrying when it's found around the organs, where it's known as visceral fat. This can be toxic and poison you from within,' says Professor Bell. Visceral fat is not an inert lump of lard, but actually pumps out chemicals and has been linked to heart disease, diabetes and some forms of cancer. Read more about visceral fat here. Professor Jimmy Bell also points out that in the larger woman's scan, her heart (which looks like a large red and black teardrop, suspended between the lungs) has clearly enlarged, the muscle increasing in response to the added strain her weight is placing on her body. An enlarged heart will not be able to pump effectively, and at the very least will lead to shortness of breath and fatigue. An enlarged heart is a common cause of heart failure, when it cannot supply sufficient blood flow to meet the body's needs. At least four per cent of deaths in the UK every year are due to heart failure, according to the British Heart Foundation. The yellow rim of fat around the heart, called pericardial fat, is also linked to hardening of the arteries. Pericardial fat secretes high levels of inflammatory proteins called cytokines. Constant exposure of the heart to these proteins can lead to inflammation of the coronary arteries and calcified plaque (the main cause of heart disease). 'Carrying at least twice the weight they are meant to means feet will get very sore,' warns Mr Hayton. The Harvard Medical School has found that being overweight places pressure on the plantar fascia - the ligament-like structure that runs from your heel to the ball of your foot, which 'may become inflamed, causing a sharp pain at the heel when walking'. Ankle joints will come under pressure, too. However, ankle replacement is a fairly rare procedure. 'Developing a thick layer of fat around the upper arm will put an increased load on the shoulder joint,' says surgeon Mike Hayton. 'As the fat builds up, it will become more difficult to lift your arm above your head - or even put your jacket on. You'll feel less flexible.' Then as you stop using the joint fully, the soft tissues will start to contract, dragging the ball and socket closer, causing bones to rub and leading to arthritis and pain. 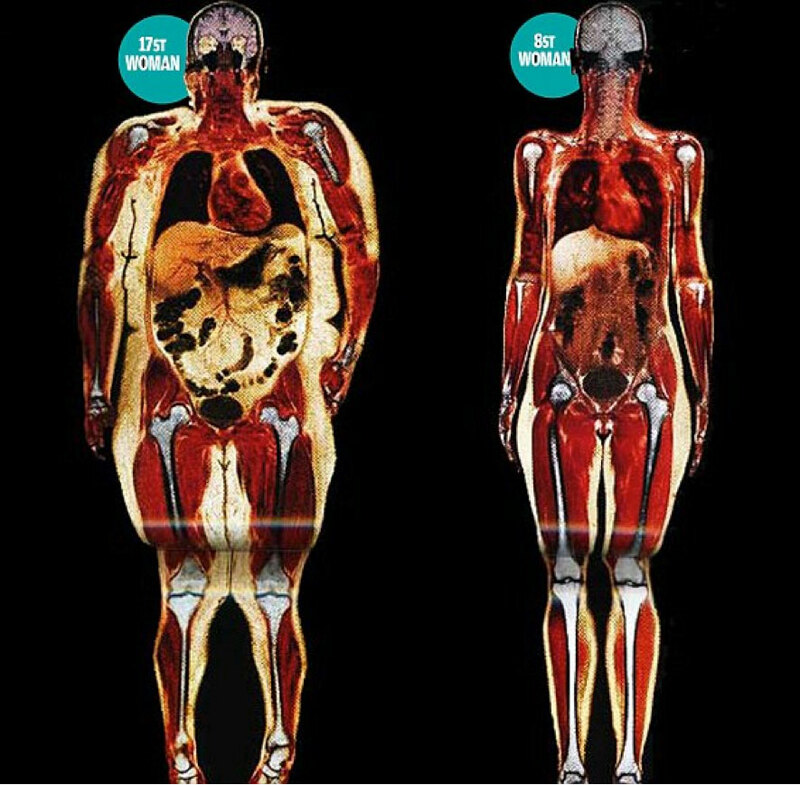 The thinner woman on the right not only has little ' surface' body fat, but her organs have minimal visceral fat. 'The abdomen is the worst place for fat to accumulate,' says Professor Bell. 'Many people assume middle-aged spread is normal, but it's not. You should accept that as you age you will be less active and need fewer calories,' adds Mr Hayton. Meanwhile, when fat reaches the digestive system it breaks down in the liver. As it does this, toxins are released into the bloodstream. These can seriously damage organs such as the liver, causing fatty liver disease. This can lead to inflammation, the formation of scar tissue and eventually cirrhosis. It is also a risk factor for cardiovascular disease.